On Monday July 5th, Raila Odinga, Kenya’s prime minister, rejected the pay increase he was awarded by the country’s parliament last week. MPs had granted Mr Odinga a rise to nearly $430,000 a year, while giving themselves a 25% increase to $161,000. 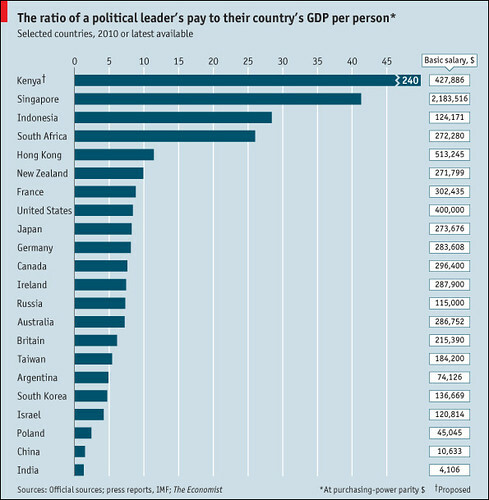 This boost would place Mr Odinga among the highest-paid political leaders in the world. More worryingly, his salary would be some 240 times greater than the country’s GDP per person (measured on a purchasing-power parity basis). Lee Hsien Loong, the prime minister of Singapore, tops our list of selected leaders’ salaries. He is paid more than 40 times the city-state’s GDP per person. At the other end of the scale, Manmohan Singh, the prime minister of India, reaffirms his reputation for saintliness by taking a modest sum from Indian taxpayers. As we ponder getting what we pay for, we might recall that it was on this date in 1957 that Prince Karim Husseini Aga Khan IV inherited the office of Imamat– the 49th Imam of Shia Imami Ismaili worldwide– after the death of his grandfather, Sir Sultan Mahommed Shah Aga Khan III. 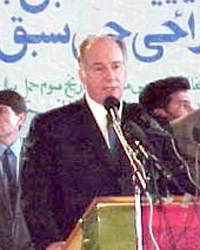 A direct descendant of the Islamic prophet Muhammad through his cousin and son-in-law, Ali, the first Imam, and his wife Fatimah, Muhammad’s daughter, the Aga Khan is the spiritual leader of Shia Muslims. And despite severe set-backs in the real estate market in the 90s, he remains one of the richest men in the world.